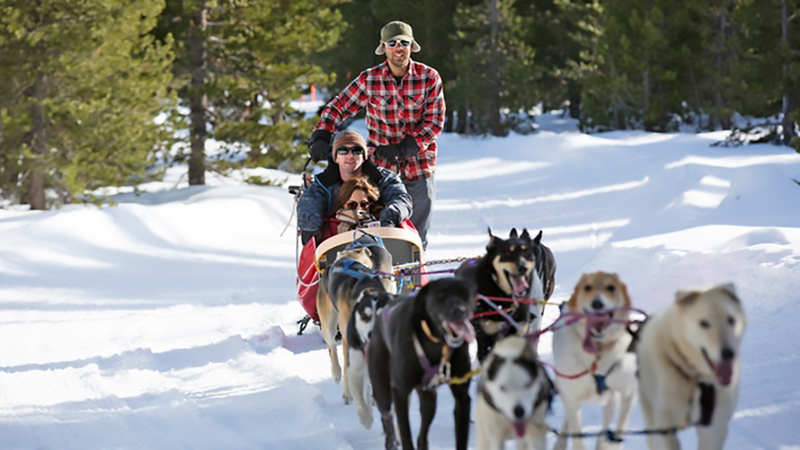 Add a wild, magical experience to your Bend, Oregon get-away with a ride behind a real dog sled team. Stay snug and warm in the sled while the team, along with a professional musher, takes you on an exciting adventure. Oregon Trail of Dreams is owned and operated by Rachael Scdoris and her family. Rachael is a world-renowned athlete and had her first Iditarod finish in 2006. Riding with their athletic team of dogs is a unique experience. Imagine gliding over the snow, taking in the sights of Central Oregon – snow-covered Broken Top, the Three Sisters and Mt. Bachelor all from the comfort of an Iditarod Dog Sled. Trips for up to three people per sled depart from Mt. Bachelor’s Sunrise Lodge three times a day. They feature approximately one hour of orientation and trail time, including an option to participate in the care, watering and feeding of the dogs after the trip. Children must be at least 3 years old to ride in a sled and those aged 2-12 must be accompanied on the sled by a responsible adult. Reservations required.